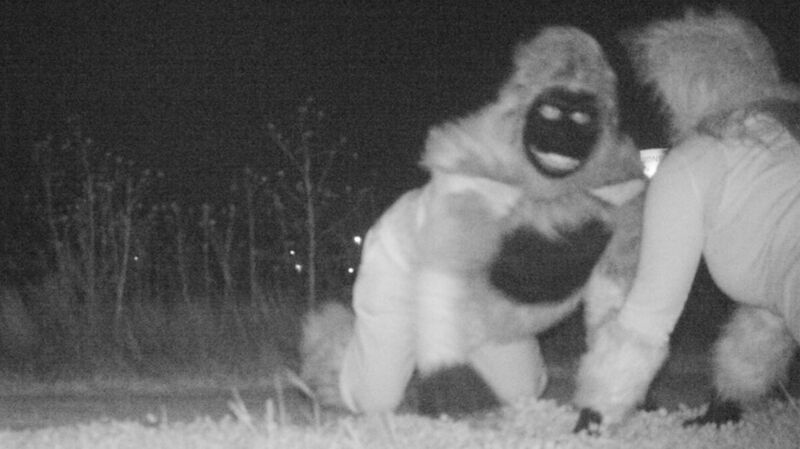 'Wildlife,' Indeed: Police Chuckle As Costumed Pranksters Preen For Park Camera : The Two-Way Trail cameras were set up to catch sight of a mountain lion; they turned up another variety of wild activity. Trail cameras in Gardner, Kan., captured wild scenes from a local park — just not the type of scenes police were expecting to see. It all started with a report of a mountain lion sighting in a city park. That's when police in Gardner, Kan., decided to install trail cameras — but instead of cougars, the cameras captured scenes of costumed people romping in the park, dressed as gorillas and, in one case, a beer-drinking Santa. The unexpectedly wild park patrons are seen in full night-vision glory, in a batch of images released by the Gardner Police Department. The cameras also captured images of actual wildlife, including a coyote and a skunk. While police were happy to report no mountain lion was seen, they were also happy for the break in routine. "We would like to sincerely thank the persons responsible as it made our day when we pulled up what we expected to be hundreds of pictures of coyotes, foxes and raccoons," the police department wrote in a Facebook posting about the images. "Thank you to the citizens who noticed the cameras. Your effort and sense of humor are greatly appreciated." Commenters were also enthusiastic — to a degree. "I thought the dating scene in Wichita was rough..." one man wrote of the pictures from Celebration Park in Gardner, a town southwest of Kansas City. Another remarked on the unlikely sight of "a pregnant woman in heel boots" prancing in a mask. On another image, a woman named Katharine Ingalls commented, " Good God, note to self....stay the hell out of Celebration Park late at night!" A Gardner police officer confirms that the department isn't trying to identify or locate those responsible for the prank, saying "it appears to have all been done in good taste and just for fun."